With Task View you can create virtual desktops. This allows you to group and manage different apps together on separate virtual desktops and quickly switch between them. To create a virtual desktop, select the Task View button and then select the New desktop button in the bottom right-hand corner of the screen. You can also use the keyboard shortcut, press + Ctrl + D keys. After you have created virtual desktop then you can open the apps you want to use on that desktop, select the Task View button again to switch between desktops. You can also use the keyboard shortcut, press + Ctrl + Left or Right arrows. 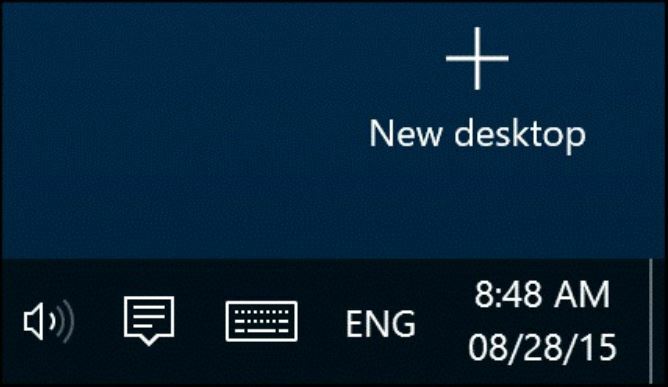 To close a virtual desktop, select the Task View button on Taskbar and then tap or click on the Delete button. You can also use the keyboard shortcut, press + Ctrl + F4 keys. You can move apps between virtual desktops by selecting Task View and dragging the app to another desktop or you can drag an app to the New desktop button to create another virtual desktop.